It “occupies a prominent hill 1.4 kilometres to the north of Guilsfield (Cegidfa) and 5.4 kilometres north of Welshpool in the old county of Montgomeryshire, now Powys. The topography of this area is dominated by the River Severn, 4.7 kilometres to the east (Fig. 2). The hills flanking its wide river plain rise gently to the west and more steeply to the east and are cut by the tributary rivers which feed the Severn. A series of prominent hills rises above the general topography, most distinctively the Breidden, at 403 metres above sea level . . . 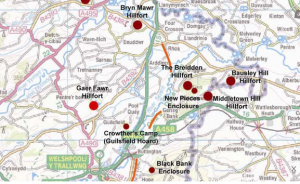 The site lies in the northern half of a dense band of large?and medium?sized hillforts extending along the border between England and Wales: from the Wye Valley and tributaries of the Severn into the central Marches, and on by way of the Clwydian Range to the North Wales coast . . .
“‘The construction covered at least two main phases. 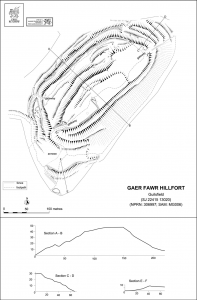 The original hillfort, enclosing about 3 acres, was probably univallate with entrances at the NW and SW ends. The second phase consisted of enlarging the original fort by enclosing a further 3½ acres to the NW side at a lower level. The new outer defences were bivallate and included very complicated entrances on the NE and SW, probably on the sites of the original entrances’ (NMRW: OS 495 Card SJ 21 SW 1). . . .
“The most likely date for this phase of construction is the early Iron Age, between the sixth and fifth centuries BC, the period in which hillfort building took off in the Marches . . . 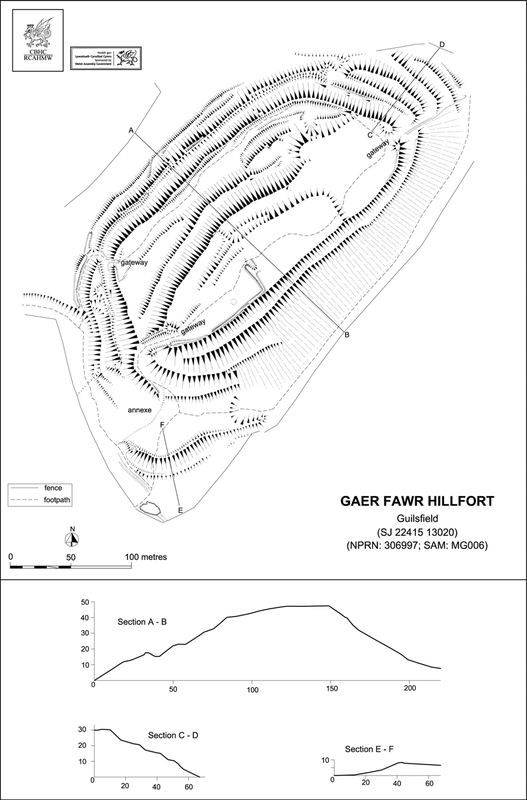 The ‘developed’ form of Gaer Fawr is likely to belong to the middle Iron Age, 400-150 BC. . . .
“One of the most noticeable features of Gaer Fawr is its defences; the scale is huge in contrast to the size of the area enclosed. Useable space totals just over 2 hectares, whereas the hillfort as a whole encompasses just over 6 hectares. As defensive features these would certainly have been imposing and would have been visible for miles, with entrance arrangements clearly designed to control the movement of people, managing both how and who approached.” In short, Caer Fawr provided the perfect place for Cade, Rhiann, andn their friends to defend Wales against a Saxon advance! ← Previous Previous post: Medieval Monday with Vijayah Schartz! Next → Next post: Medieval Monday with Jill Hughey!